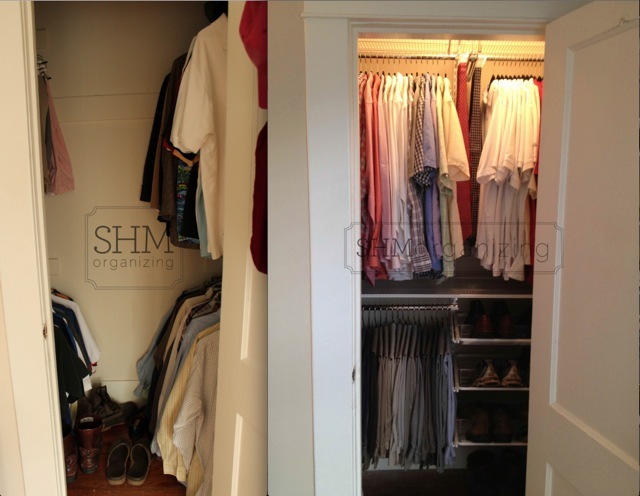 This closet is a great example of fashion and function. 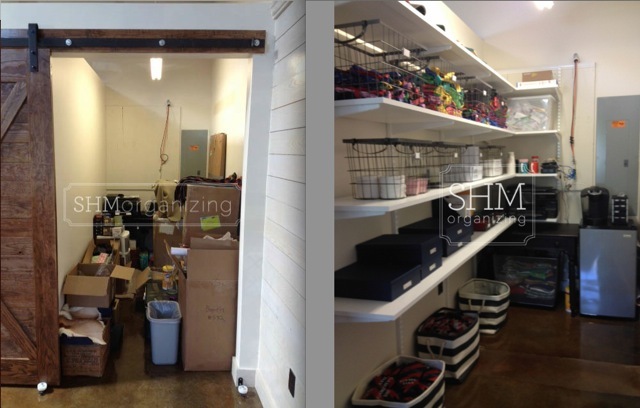 Not only does the new shelving unit look great, but we gained two extra feet of hanging space by changing the layout. The original rods were installed all wrong, so clothes dragged on the floor or had to be hung at an angle. 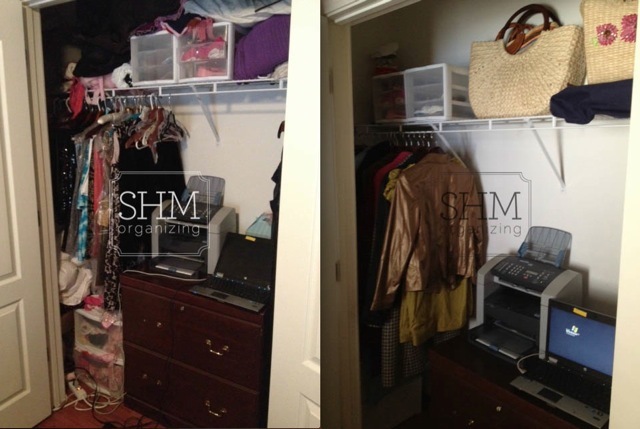 This client's wardrobe was spread out between three areas, and now it is all in one place (with a working light fixture) and a cinch to maintain! 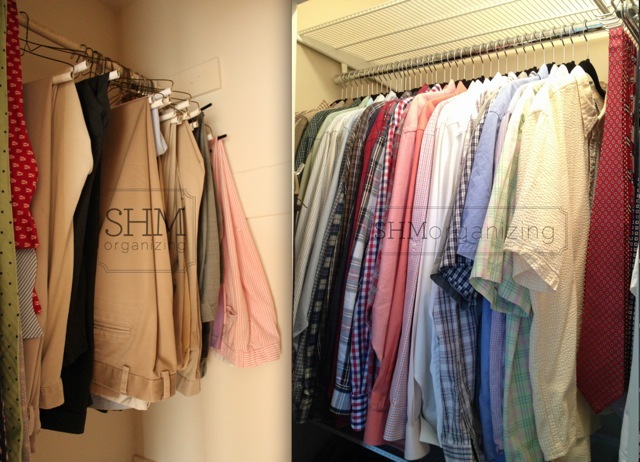 And who doesn't love matching hangers...makes all the difference!! 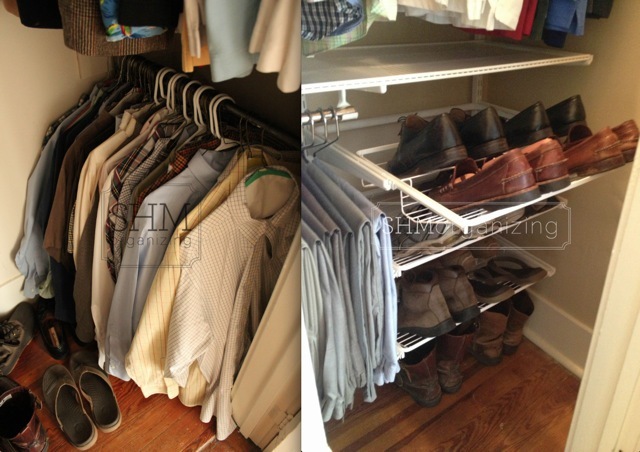 I was hired by Southern Proper to organize the storage room in their Atlanta office. The goal was to be able to easily view & access their samples. Since these were sample ties & hats and didn't have to be folded or displayed a certain way, we decided to get a little creative with storing them. Tie a tie! Grouped by pattern. This client realized out of sight isn't always out of mind. Her basement, like most basements, was the catch-all. But the clutter had become too much. Additionally, severe weather had just hit our area and this family needed a safe place for emergencies. So we did some major purging and used the top of an unused wooden table (turned on its side) to enclose a safe place under their basement stairs. If a kitchen is the heart of the home, then a pantry is the main vein that helps that kitchen tick. 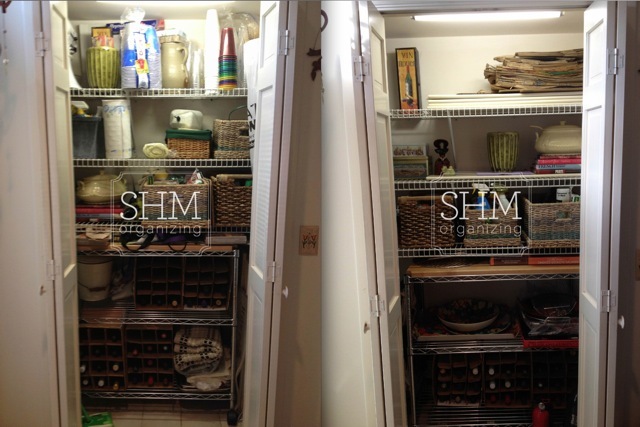 This client was blessed with several pantries and closets near her kitchen, so we reorganized all of her storage areas and designated this pantry for cookbooks, cleaning supply bottles, wine bottles, grilling supplies, and some miscellaneous pieces. Most importantly, we located her fire extinguisher and placed it front & center. 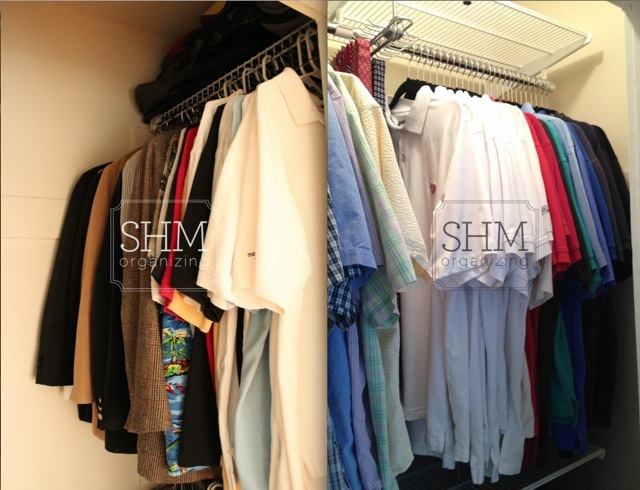 This couple wanted to sell their house as quickly as possible, so they hired me to help them tidy up their space - especially their closets. 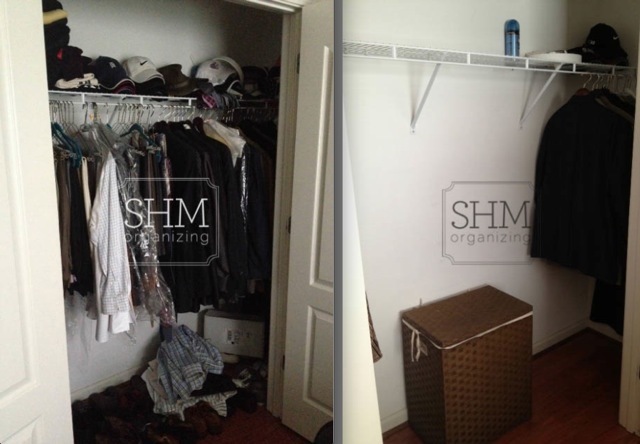 Since time was of the essence, we focused more on staging their house to sell rather than proficiently organizing it for them to live in long-term. 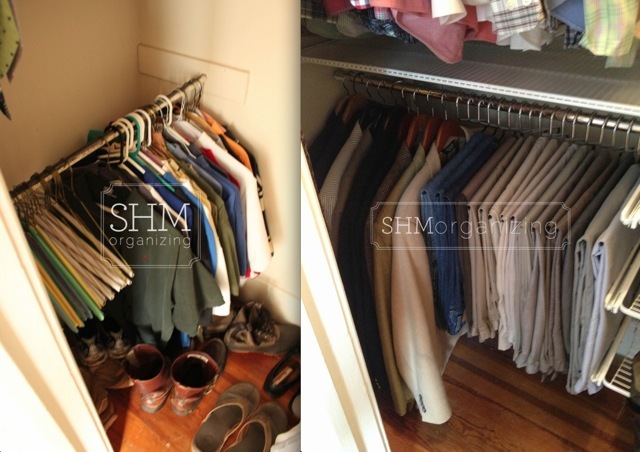 Replacing the "dry cleaner hangers" and other bells & whistles were not on this client's wish list - it was more important during the limited time we had to simply clear the clutter to get their house market-ready.